The Balance 526 was the star of the Miami Boat Show this past February, turning heads and eliciting praise from all quarters of the industry. 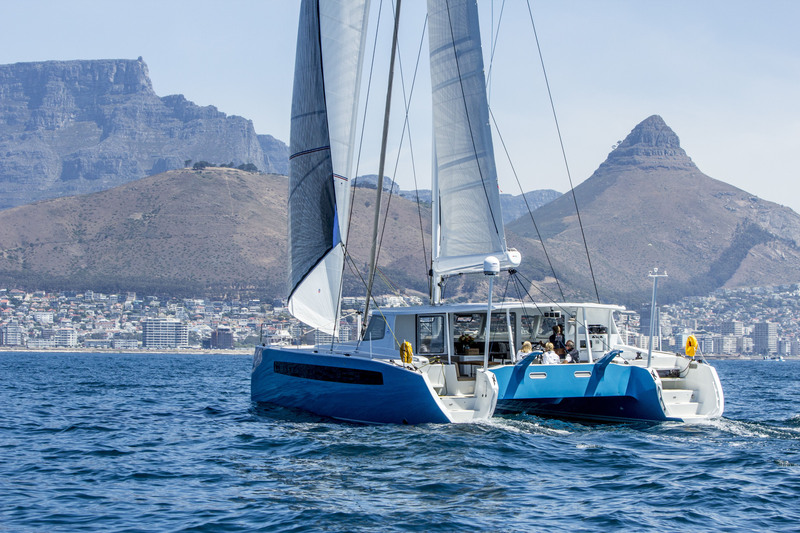 She’s a stunning high-performance catamaran that represents the exciting rebirth in South Africa of the high-end, labor-intensive, epoxy/ carbon build techniques first employed by Gunboat in Cape Town in the mid-2000s. You would guess the rest of the boat would be chock full of additional radical innovations and cutting edge ideas, but for the most part it isn’t. If anything, The Balance 526 is a terribly pragmatic catamaran. This reflects the design team’s view that you only reinvent wheels that don’t work and improve upon the ones that do. Du Toit and Paarman said they drew heavily from Berman’s firsthand experience managing the sale of hundreds of catamarans over the past few decades. In speaking with Paarman on the boat — a soft spoken former professional surfer and one of South Africa’s most storied boat builders — he said that if his years at sea have taught him anything it is that a boat has to be strong, fast, and functional. On deck you see his philosophy everywhere – the stern steps are easy to navigate; there is a wide platform to get on and off the tender; the two shrouds are designed so you can walk between them down the wide flat decks; hand rails are molded right into the coach roof; the bimini posts and davits are artfully carved carbon composite; the cockpit is clean and practical, with well thought out seating, great ventilation, and superb visibility forward looking through the high, vertical glass salon windows. The flow from salon to cockpit to water is superb. The Balance 526 is certainly no condomaran. When you walk up to her on the docks she looks fast just sitting there. She is clearly a racehorse, coming in light ship at just a bit over 10 tons, thanks to Paarman’s fastidious boat building skills. To place that into perspective, two Balance 526 catamarans weigh less than one Lagoon 52. The #1 hull that I inspected was spray finished in a gray blue color and the fairing quality was flawless, not a single bump, wave, or imperfection in her shiny blue hulls. It is hard to imagine the amount of time it took to fabricate tooling that allowed for this, or the amount of time spent fairing her to gain such finish. As a boat builder myself, it is difficult to explain to an amateur what a challenge it is to craft a hull painted such a dark color and not find a single imperfection. The 526 is really a custom, highend racing-type build, representing a standard of construction far higher than one finds in a production model. She’s a sort of Aston Martin- or Ferrari-type catamaran, but du Toit likens her more to a 5 Series BMW—“She’s got a lot more interior comfort than a super car.” Surprisingly, at a base price of $1,299,000, the 526 is only marginally more costly than middling quality performance builds of similar length. This is likely the beneficial result that comes from building a high labor catamaran in South Africa rather than Europe or North America. Berman said that when they began the project they were aiming primarily for the Gunboat customers who wanted a more practical design that could handle greater payloads and offer more creature comforts. Certainly the quality of the 526 is every bit as high, if not higher, than the finest Gunboats that were built in Cape Town. In speaking with Berman, he said the most important part of the design study was to recognize that people who buy such boats typically want all the creature comforts, so he and du Toit underwent a very careful weight study and elected to flare their hulls nicely as they go aft to carry significant payloads without the steep performance degradation you find with narrow, flat-sided performance cats. As du Toit commented to me, “Of course, if you keep her lighter and empty she will go even faster, but when you load her up for a long passage she will still perform quite nicely – far better than any of our performance competitors. Berman and du Toit are big believers in dagger boards, so the 526 sports dual carbon fiber boards that remain flush with the deck. They are operated with lines that come back to the cockpit near the stern steps and I found them simple to operate. The boards themselves are buoyant, so they take little effort to raise. To bring them down you simply winch them into place. Balance does offer the boat with fixed performance keels, at a reduced price, for those who prefer this. The 526 sports a 28-foot beam, her mast is 78 feet off the water, and she carries 1,696 square-feet of sail…so this is one powerful catamaran. Paarman, who sailed her extensively for her trials in Cape Town, told me she will often do wind speed in 8 knots of wind or more. Clearly du Toit wanted the 526 to be sailing, not motoring, and her powerful sail plan reflects this. On the 526, the underwing clearance is about 36 inches, depending on how she is laden, so she will not be a cat prone to slapping or pounding in rough seas. During my time in Miami, the winds were 4 knots or less. It made no sense to test sail her in such conditions. The best thing I could do was spend a bit of time with her owner, Dr. Jeffrey Phillips, who remained in close contact with the crew on her delivery from Cape Town. “When we were sailing in Cape Town,” Dr. Philips commented, “before we loaded up all the fuel and water tanks, even in very light airs, Ondine wanted to perform close to wind speed when reaching. After we had her loaded up totally, just before she left Cape Town, full to the brim for a 30 day passage, we found we were doing 10% below wind speed during the first part of the trip. As she went along and fuel stores dwindled she went right back up to wind speed in 8 knots of wind or more, in that range. Unfortunately, we had a very light passage all the way until we got to the Caribbean, often with winds fewer than 6 knots. In these conditions it is not possible to really generate great apparent wind, so the crew flew the symmetrical spinnaker a great deal, which limits you to wind speed or less.” “Looking over the logs, once she got into the Trades, when the crew were able to pull out the screecher, anytime they had winds around 12 knots they we would be doing 9 to 11, and anytime they had 14 to 16 knots, they could do a 12 knots average, give or take. The standard 526 comes with 45 horsepower Yanmar engines, but so far every customer has elected to upgrade to the new Yanmar 57 since it is the same engine body, nearly the same weight and the extra charge is not considerable. According to the crew, Ondine flies under power. She is capable of doing 11 knots using both engines at full power, but they have found that she will motor nicely at 8 knots with one engine at 2,600 RPMs or less, depending on sea state and wind. As the engines are both contained in their own aft compartments, apart from the living spaces and totally sound-shielded, the crew said she is very quiet under power. The Balance 526 is made with e-glass, with extensive use of carbon in all of the high load areas. Her hulls, decks, and all of her furniture and bulkheads are foam core and every fiberglass part on the boat is epoxy impregnated. At present, Paarman is doing a combination of wet preg and bag preg, depending on the parts. According to Paarman, wet preg builds are lighter and stronger than infusion builds, so long as you are very careful in your lamination. They have conducted a range of experiments with small panels and found that the infusion process is actually a bit heavier. The advantage of infusion, says Paarman, is that it is cleaner. Paarman’s greatest concern with infusion builds is the high failure rate of laminations reported by so many marine surveyors over the past few years, because small mistakes multiply and lead to ‘dry glass’ areas where the glass does not adhere to the core and invariably leads to delamination. In addition to using e-glass, carbon, and epoxy in the hulls, decks, Paarman uses all carbon posts for his bimini and hand makes his own sliding doors in composite. “Aluminum and stainless salon doors are very heavy and ill-suited to the light weight, high performance objective of our builds. Also, the more metal you can remove from a boats exterior, the less corrosion and maintenance you have. I have an anti-stainless fetish. If I can do something in composite I will do it over stainless or aluminum whenever possible. It takes a lot more time and labor, but the end result is superior,” says Paarman. Berman and du Toit set out to design a boat that could easily be sailed by a cruising couple, or even single-handed, so every Balance 526 carries a rollerfurled, self-tending blade jib. Tacking is therefore a simple matter of turning over the helm that drives her mechanical Spectra cord-steering system. Not a single sheet has to be touched. Each 526 is, however, to some extent a semi-custom project. The boats can be configured to have all of their line handling in the upper helm station alone, or a combination of the line handling managed in the aft cockpit. On the boat I inspected, you could adjust the mainsheet in the aft cockpit or up in the helm station, but all reefing and halyards and topping lift were in the up station. The lines themselves are routed down from the coach top onto a plinth, and I found them easy to reach and liked the massive line storage box just beneath them. On hull #1 the owner elected to have a Southern Spars carbon in-boom furling system with a Reckman electric mandrel and a two speed electric Harken winch for the halyard. According to the crew, the system wasn’t working quite right at first because the loads on the halyard were too high for the winch on the 1 to 1 halyard first installed. Southern Spars later elected to install a 2 to 1 halyard and by all accounts it is now working well. The standard 526 comes with an aluminum mast made by Southern Spars, but two of their customers have elected to spend a bit more for a carbon spar, also made by Southern Spars. The carbon mast on hull #1 was truly beautiful, made in Sothern’s Cape Town factory and clearly of the highest possible standard. The fore-beam and longeron are also standard in aluminum, but can also be ordered in carbon. These parts are made for Balance by Jazz Marine, which is operated by former Gunboat builder Uwe Jasperson. Paarman and Jasperson are part of the storied Cape Town build scene with long backgrounds in racing and high performance epoxy hull construction and have worked together for many years. The interior of the 526 is all hand-crafted furniture, foam sandwich, which is very light and strong. Each customer, more or less, chooses their interior wood and finishes as they please. Ondine had lovely dark, real wood veneer Wenge floors and light ash wood furniture, sporting a modern, Italian design-look. The customer for the boat, however, did not wish his cabinets to be finished, but rather to have a sort of wax-type product used called Ruby Monocoat. I myself prefer some sort of satin or gloss finish, but it was clear the quality of the cabinetry, which is abundant, was very high. The aft owner shower and head is massive, surely the most spacious owner shower I have ever seen on a cat of this size. The owner, in fact, has two showerheads because the space is so large. Berman said that he cannot stand claustrophobic showers and bath spaces and always insists on big ones in his boats. The 526 certainly has this in spades. The designers did not want to put chines or protrusions in their hulls, or run master berths sideways in the aft sections of the hulls to avoid over-fat sterns, so they elected to place the master, queen-sized beds forward, across the bridge, with steps to get up on either side. They built in plenty of headroom over the beds for sitting up and reading and I found them to be comfortable and easy to get into and out of. 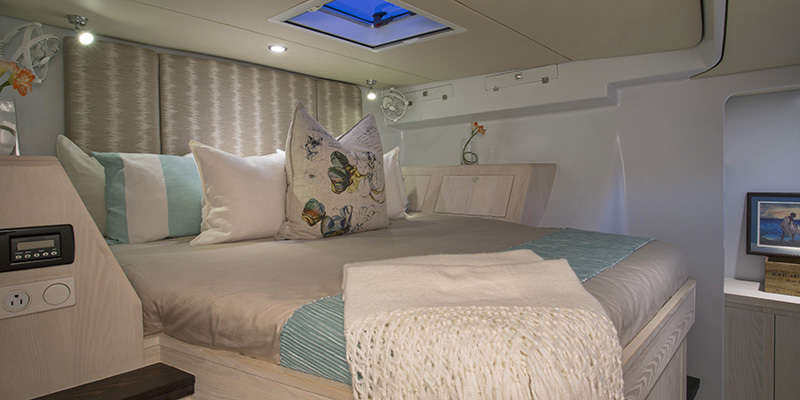 On the non-owner side, they have a double bed that runs fore and aft in the aft cabin. The entire interior below, in both hulls, is a model of efficiency. I thought the decision, on the port side, to have separate head and shower rooms was intelligent. It increases the efficiency of the spaces when both fore and aft cabins are occupied. Berman himself does not believe in “nav stations” and therefore designed an office in the main salon for working on the computer and filing papers. The U-shaped galley is functional and practical. The salon window slides away and it is easy to pass food to the outside and for the cook to remain in any conversation with those inside or outside. 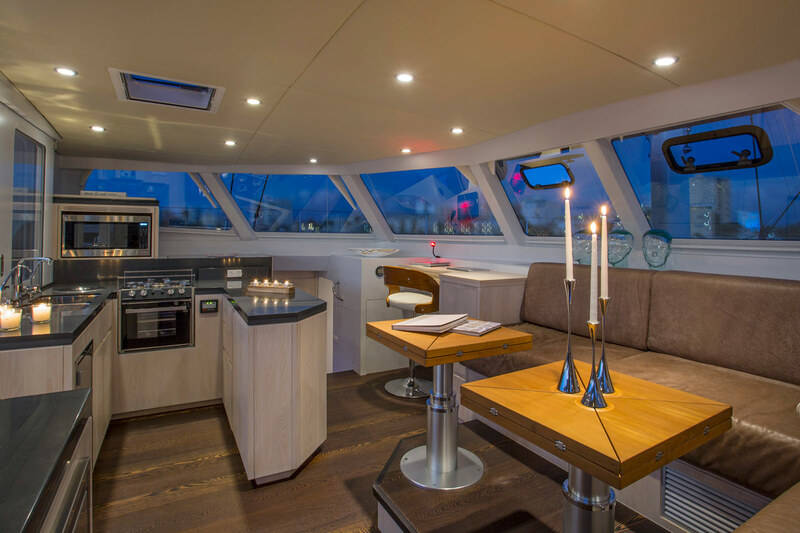 Certainly the openness between the interior salon and galley and the aft cockpit is excellent and impressive. The two spaces really do remain one for nice weather, but the interior salon can be totally closed off from the cockpit in foul weather with the composite sliding door and windows crafted by Paarman. To my mind this offers the best of both worlds for a serious live aboard voyager. No boat of course is perfect and we all know that design decisions always amount to trade-offs of one sort or another. One trade-off on a high-performance cat with narrow hulls and high underwing clearance is that she is, well, high up. On the Balance 526 that means that her steps from the salon into the hulls are steeper than what you’d find on a wide-body charter design with lower clearance. To ameliorate this problem Berman designed her with tread stairs, with alternating foot paths, and this was a brilliant decision. It does take a bit of time to get used to them. You have to start always with going up on starboard with your right foot, and to port you have to start with your left foot. It works just fine, you simply have to adjust to it. Another inevitable issue that arises on a narrowhulled high-performance catamaran with dagger boards is that it can start to get cramped in the hull passages. On the owner side of the 526 you have no problem at all as the cabinets on the interior allow for plenty of room. On the port side, however, when going forward it gets a bit narrow between the shower room and the generator locker on the hulls interior. All of the wiring for Balance 526 models is done by Waterline Systems, Cape Town’s well-known marine electrical contractor. As each customer to date has wanted very specific things, each 526 has had to be wired uniquely. On Ondine, the owner elected to work with Bruce Schwab from Schwab Energy Systems to provide the Lithium-Ion batteries and to work with the Waterline Systems to design the overall electrical panels and systems. I was told that over 17 kilometers of wire were used to manage the very extensive electrical needs of this boat, yet everywhere I looked, the quality of the workmanship was state-of-the-art, high-end, clean, well-designed, easily accessed and marked and coded. The Balance 526 is in a class of her own. She will hold strong appeal for the highly discriminating, affluent sailor who seeks a deeply practical performance catamaran that wants to go places in style. She represents that very rare occasion where great design and superior construction merge to create a truly remarkable yacht. It isn’t very often when a catamarans brand name so perfectly reflects the end result: A masterful ‘balance’ between performance and comfort, quality and value, beauty and practicality.